On March 18, the young moon will be tough to spot from Asia or the Southern Hemisphere, but the rest of the world has a shot at it. On March 19 and 20, we should all see the young moon. Watch for the returning young moon, and the planets Mercury and Venus, beginning on the evening of March 18, 2018. The planets will still be there – and the moon will become much easier to see – on the nights of March 19 and 20. On March 18, if you’re far enough west with respect to the International Date Line, and especially if you’re in the Northern Hemisphere, you’ve got a good shot at seeing a whisker-thin very young moon. The moon will be only one day past new moon on March 18, and thus the moon will be a very fragile crescent indeed, very lovely, setting soon behind the sun. Sometimes, you can’t catch a young moon for a couple evenings after new moon. And sometimes you can’t see planets so near the sunset. 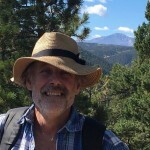 But – around the spring equinox – you can. That’s because the ecliptic (path of the sun, moon and planets) stands nearly straight up with respect to the western horizon after sunset in spring. The spring angle of the ecliptic places the moon and planets at their highest above your horizon, after sunset. View larger. | Here’s what a very young moon, in springtime, looks like. It’s a very slim crescent, above the sunset, deep in western twilight. 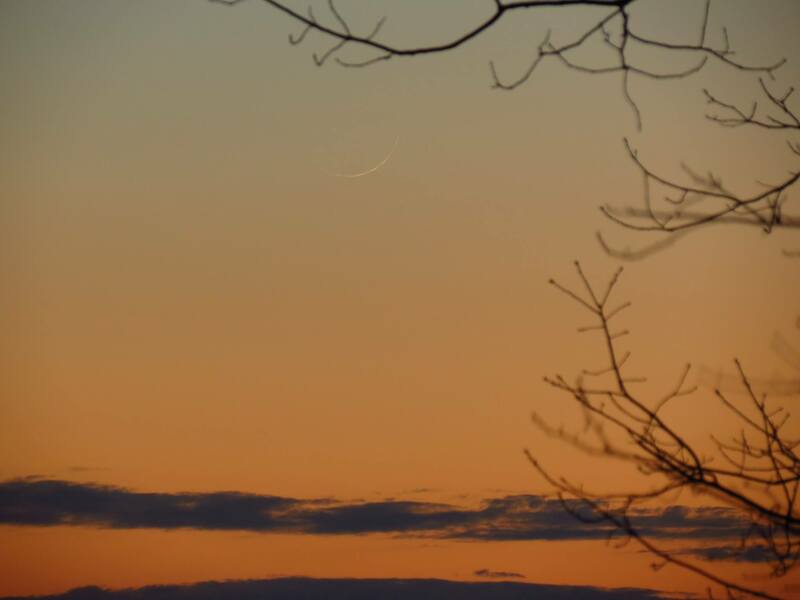 Karen Houle of Connecticut caught this young moon in March 2016, when the moon was only 21 hours and 13 minutes past new. Of course, Mercury and Venus are up there, too, briefly, in the west after sunset. We’ve been seeing many photos of Venus, from all over the world, since mid-February, and Mercury joined Venus in early March. Venus is an exceedingly brilliant planet, third-brightest celestial body after the sun and moon. No matter where you are on Earth on March 18 to 20, if you spot Venus at western dusk, but don’t spot Mercury, try aiming your binoculars at Venus. Mercury and Venus have been in a single binocular field all month; they still are. 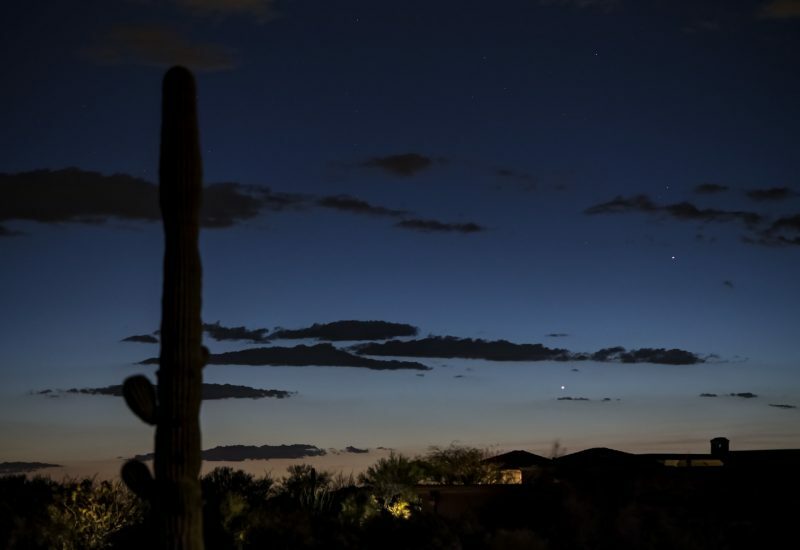 Here are Venus (below) and Mercury after sunset on March 14, 2018, via our friend Eliot Herman in Tucson, Arizona. This photo was taken on the evening before Mercury’s greatest elongation, or greatest apparent distance from the sun on our sky’s dome for this evening apparition. After this, Mercury will quickly drop back into the sun’s glare. On March 19 and 20, Venus and Mercury will still be lingering lower in the sky – closer to the sunset – but the moon will have waxed larger. It’ll be higher in the sky after the sun goes down. Look at the image at the top of this page again. Notice that the lighted portion of the moon – the illuminated crescent – will be pointing toward Venus and Mercury on March 19 and 20. To see the young moon with Venus and Mercury on March 18 to 20, you’ll want a clear sky and unobstructed horizon in the direction of sunset. A lofty view from a balcony or hill will be to your advantage, too. From northerly latitudes, it should be relatively easy to spot Mercury with the eye alone, unless your western sky after sunset is murky. From the Southern Hemisphere, you might need binoculars for Mercury; it’s autumn there now, and the angle of the ecliptic is low, placing Mercury to one side of the sunset instead of above it. This illustration shows the view from Earth’s Southern Hemisphere now, where it’s autumn. 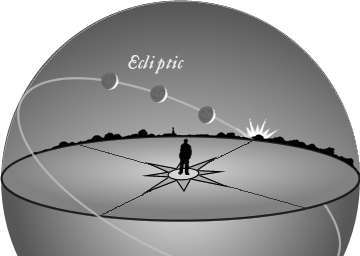 The autumn angle of the ecliptic – or sun and moon’s path – makes a narrow angle with the horizon, making young moons and planets near the sunset harder to see. Image via classicalastronomy.com. Bottom line: No matter where you are on Earth, look west after sunset on March 18 to 20, 2018, for the young moon and planets Venus and Mercury. Recommended almanacs can help you find setting times for the moon and planets in your sky. Read more: What’s the youngest moon you can see with your eye alone?